The addressable market for mobile diabetes solutions - including sensors like Google diabetes contact lenses and diabetes apps - will rise to 310M users (diabetics with smartphones). With 1.2M users in 2013 this is a yearly growth rate of 71% (CAGR) for the next 5 years. Mobile Apps supporting diabetes patients are currently only used by 1.2% of the target group (2013). Although the market penetration will grow to 7.8% by 2018, the full market potential is not yet exhausted. The next five years will bring the diabetes app market to a new level. Chances for a major market breakthrough have improved. By the end of 2013, only 1.2% of the diabetics with a capable device use a diabetes app (1.6M users). Over the course of the next five years the market environment for diabetes apps will improve. 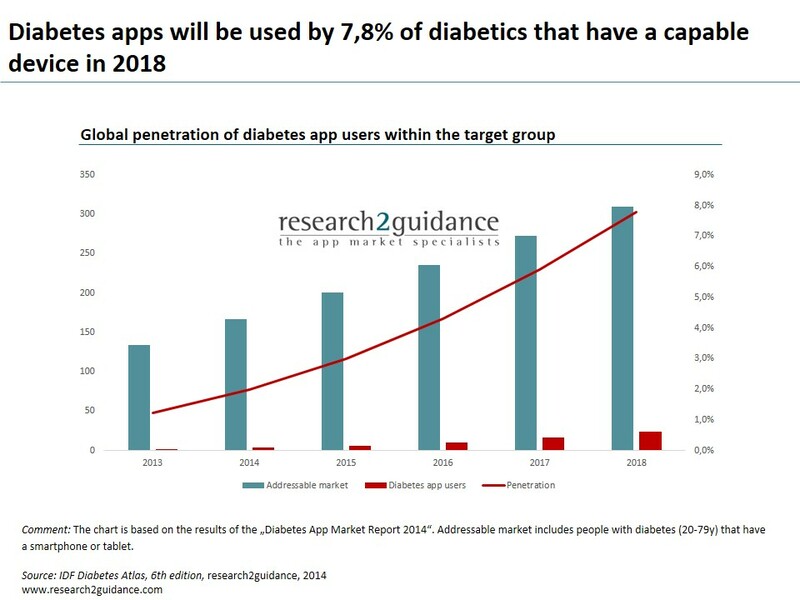 The usage of diabetes apps within the addressable market will reach 7.8% in 2018. 24M people will actively use a diabetes app to manage their health condition. These are findings from research2guidance’s latest “Diabetes App Market Report 2014”. 1. The ongoing growth of people with diabetics that are addressable with an app. 2. The changing of the role of mobile apps. From a stand-alone product to a bundle product, that leverages the app as a tool to sell devices (e.g. plug-in glucometers and wearable sensors) and services (e.g. remote monitoring and consultation). 3. An ongoing increase of the total supply of apps and of apps that adopt best practice elements for diabetes apps. 4. The beginning of the reimbursement of diabetes apps costs by traditional payers in countries with high yearly treatment costs for a diabetic patient. Based on the value mobile apps can have and the size of the addressable market, diabetes apps are being constantly rated in research2guidance’s yearly mHealth app market surveys as the therapeutic area with the highest business potential for mHealth apps (76% of mHealth app publishers). Mobile applications promise to play an invaluable role in assisting people who suffer from diabetes to empower them to better manage their condition and as a consequence reduce healthcare costs. Mobile apps can aid in the daily management of diabetes by supporting behaviour changes, facilitating communication and easing the hassle of keeping track of all relevant parameters that have an influence on the disease. Currently diabetes apps are not meeting the expectations of app publishers, healthcare professionals and diabetic patients, which leads to a low acceptance rate within the target group. The main reason is that the majority of today’s 1,100 diabetes apps do not meet best practice standards. Apps still rely to a great extent on manual input of e.g. test results. Interoperability with existing glucose meters and health & fitness apps to import blood sugar test, activity and food intake data is only an exception. Only a few diabetes apps take care of the important motivational aspect of diabetes management by using gamification elements, a supporting design as well as communication features to get feedback from friends and the physician. Another reason is that traditional healthcare payers have not yet started to integrate diabetes apps into their reimbursement schemes. In their view the quality of the numerous existing clinical studies is not good enough to justify the expenditure. Diabetes has become a global epidemic with significant impact on the society and the economy in a country. In 2013 around 382M people around the world were estimated to suffer from diabetes. By 2035, the number of people with diabetes is expected to reach 592M (IDF Diabetes Atlas, 6th edition). The above findings are based on the results of the “Diabetes App Market Report 2014”. The report includes a comprehensive market analysis of the diabetes app market from 2008 to 2018.